I discovered this recipe on the Food Network website – it’s now my favorite way to make falafel. Its an easy kid friendly vegetarian meal… chickpeas are such a great source of protein and fiber. It can be eaten by itself if you are carb conscious, or with pita bread and salad. You can serve the falafel waffles with a variety of different sauces such as homemade tzaziki. They also freeze well and are easily reheated in a toaster oven. Put the cucumber in a colander, sprinkle with 1/2 teaspoon salt. Let this sit for 30 minutes, (water is drawn out of the cucumber so the sauce is not so watery) and press gently to remove the liquid from the cucumber. Add the cucumber to the remaining ingredients . Season with salt as needed. Refrigerate for at least 1 hour before serving. Preheat a waffle iron (on maximum settings if your waffle maker has settings). Add the above ingredients to a food processor and blend until smooth. Brush both sides of the grid with oil, and pour about 1/2 cup batter in the middle of the waffle iron. Check the waffle when the light goes out, as you may need to leave the waffle in a few minutes longer until it is crisp about 6- 10 minutes. Serve with Tzatziki sauce and harissa sauce, cilantro chutney or a tomato cucumber relish. These savory appetizers are made with tortillas and are filled with either chickpeas or corn. A tasty corn alternative for those who have a Trader Joe’s near by, is the Mexican Style Roasted Corn with Cotija cheese. Make ahead: the cups can be baked up to 2 weeks in advance and stored at room temperature. Preheat the oven to 350. Spray mini muffin pans with cooking spray. Cut out large circles from the flour tortillas (even easier with a cookie cutter if you have one) and press into the mini muffin pans. 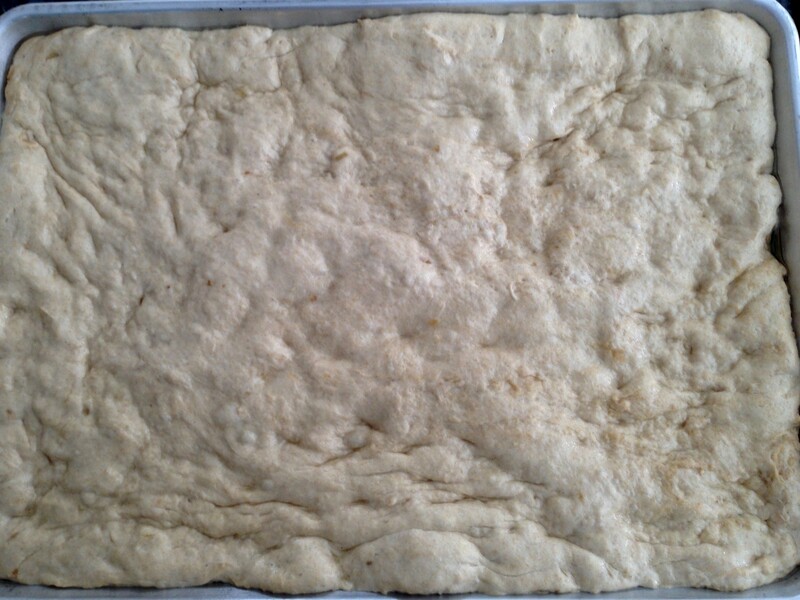 Bake for about 5 minutes until light brown. Remove from pan and cool on a wire rack. Note: These can be made ahead and stored at room temperature in an air tight container for 2 weeks. Heat the oil, add onions and saute till light brown. Add the tomato and cook for a minute. Add the remaining ingredients and stir until mixed well. Cool until room temperature. Fill into tortilla cups and serve. Heat the corn in a pan, add the cream cheese and cook on low till the cheese is softened over the corn. Add the remaining ingredients. Cool until room temperature, fill cups and serve . Prepare according to directions, cool until room temperature and fill. I came across this delicious cauliflower recipe on FoodNetwork.com as I was looking for a new dish to try for a luncheon with a vegetarian friend. I added a slight twist and used ready made roasted peppers to make it even quicker. You can use any spice seasoning that you have – on my most recent trip to Baltimore, I discovered McCormick’s new Jalapeño, Sriracha and also Chipotle seasonings which would work well. Mix the cauliflower with 2 tablespoon olive oil and salt and pepper, and spread on a baking sheet. Roast in the oven for 15 – 20 minutes, stirring half way . Heat the remaining 1 tablespoon oil in a small saucepan, add the garlic cloves and saute for 1-2 minutes. Add the red pepper or (drained roasted red pepper )and the seasoning of your choice. Cool for a few minutes. Pour into a blender along with the yogurt and blend to smooth puree. Mix in 2 tablespoons chopped cilantro. Before serving, toss the red pepper sauce with the cauliflower and simmer for 2 minutes. 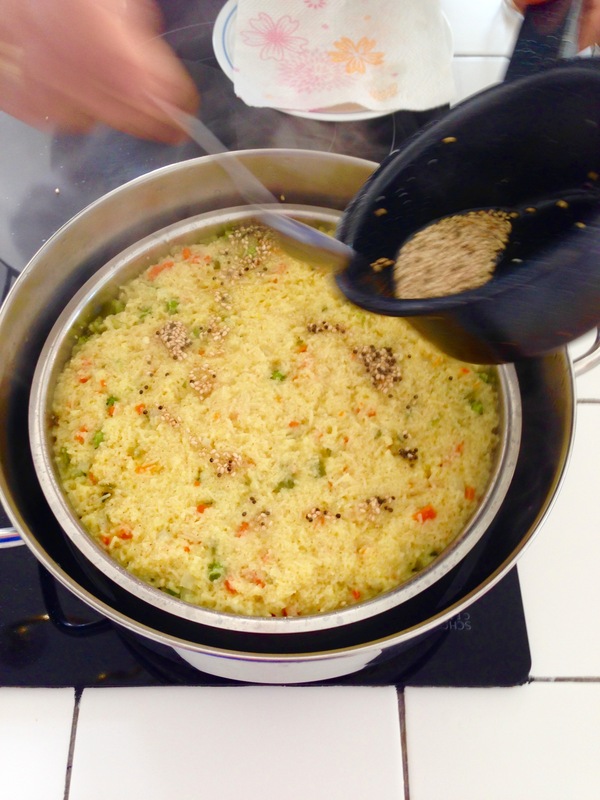 Add the breadcrumbs and sesame seeds, and heat through. Garnish with remaining chopped cilantro. In the summer when corn is plentiful I always think about this flavorful corn dish. 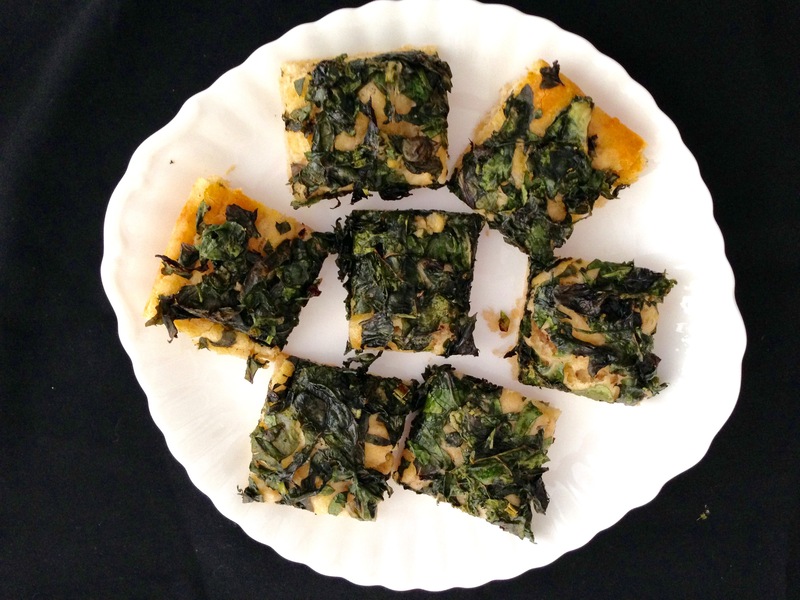 My cousin shared this recipe with me years ago – I have made it many times with both Indian and western meals (adjusting the amount of green chilies according to taste). Curry leaves do add to the flavor of the dish but they are optional – they are the only ingredient you may need to buy from an Indian grocery store (if you don’t already have a curry leaf plant in your garden!). Blend the green chili, 1/2 teaspoon cumin seeds, 2 teaspoons ginger, 8 curry leaves, 1/2 cup cilantro, water and oil into a paste. Heat oil, add remaining 1 teaspoon cumin seeds and mustard seeds, and as the mustard seeds start to crackle add the dry red chillies and 5 remaining curry leaves . 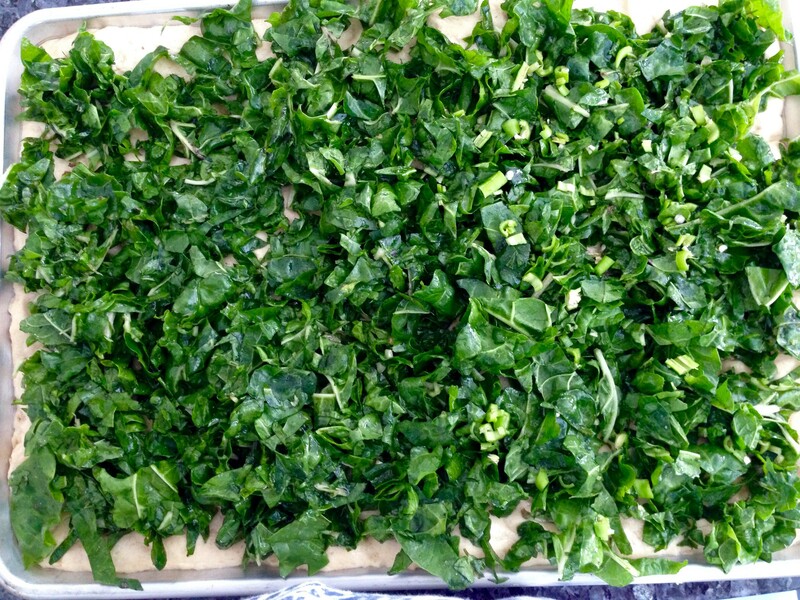 Stir and add the green paste, cook for about 1 minute. Add the flour and and stir till well blended. Add the milk & half and half very slowly to make a thick paste. Bring to a boil. Add the corn and salt and cook for about 4 minutes . Poha, also called Pohe, is beaten or flattened rice – a popular dish from the state of Maharashtra. 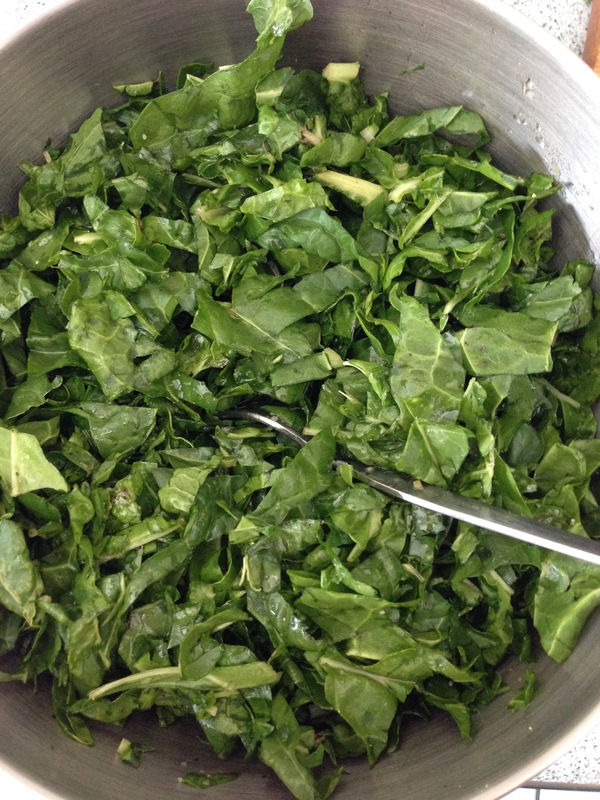 Though traditionally eaten for breakfast or a snack, it is a super quick option for any meal. Place the raw poha in a sieve and rinse it with water for a minute or two. Set aside. Heat oil in a saucepan and add the mustard seeds. As the seeds start to pop, add the onion and saute for a few minutes till it becomes light brown. Add the green chillies and curry leaves, and stir for 30 seconds. Add the turmeric, salt and potatoes and the rinsed poha Stir until combined and add one or two tablespoons of water, if the mixture looks dry. Cover and cook over low heat for about 3 minutes. If adding peas, add the peas and continue to cook for another minute. Squeeze the lime and garnish with chopped cilantro leaves. 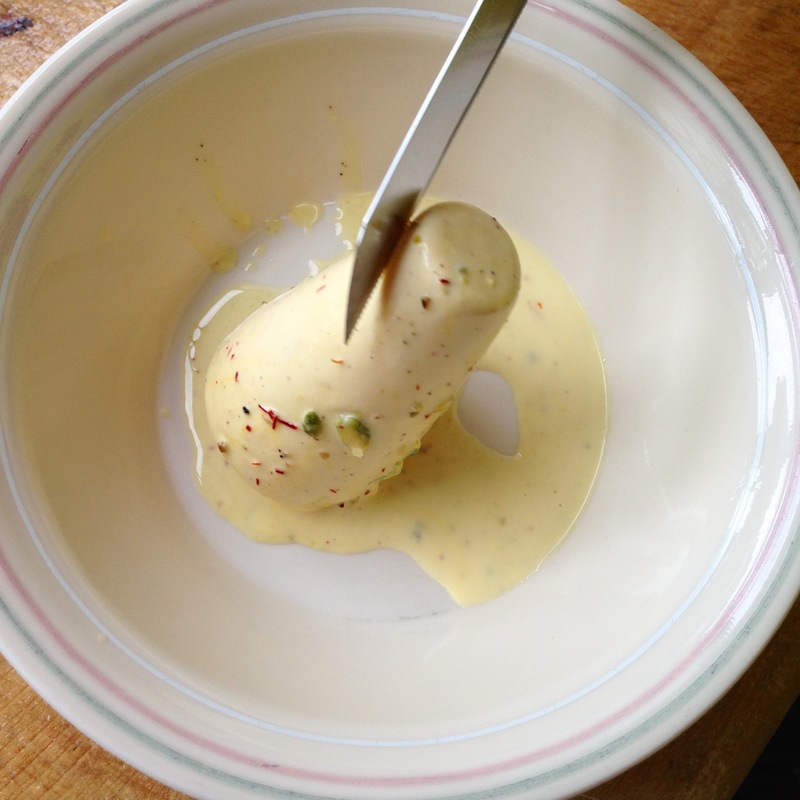 Kulfi is traditionally made from just milk, simmered down for hours and poured into this typical conical mold pictured here, and frozen. 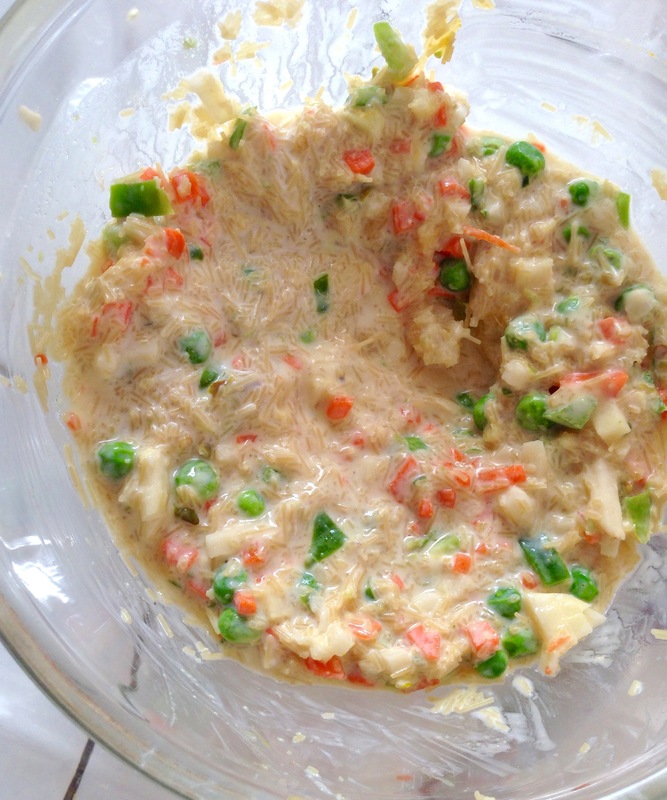 My favorite quick and easy recipe uses evaporated and condensed milk to make it rich and creamy. Any shape of popsicle mold or even a ice cube tray will work. 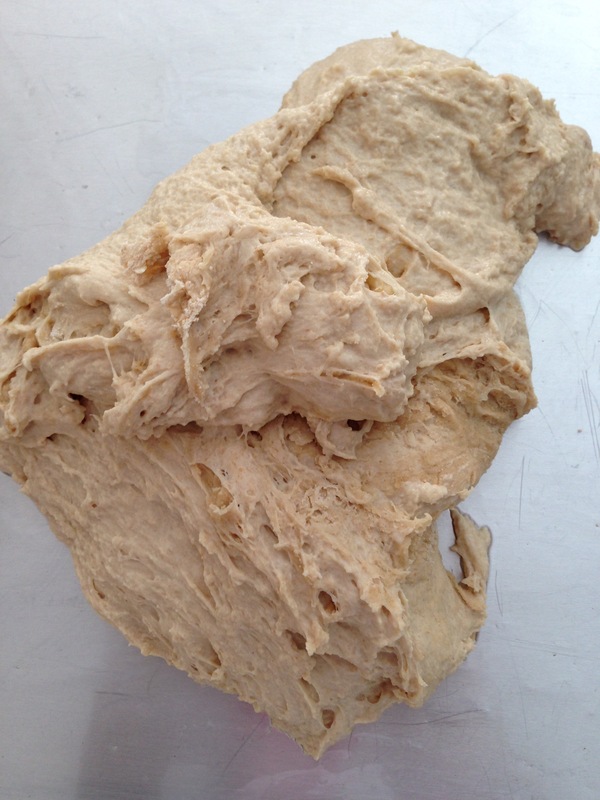 Add all the ingredients together in a large bowl, and beat with a hand mixer till the liquid is well blended. Pour into the molds. Freeze overnight. Dip into water water to remove from the molds just before serving. Slice and serve with additional nuts if desired. 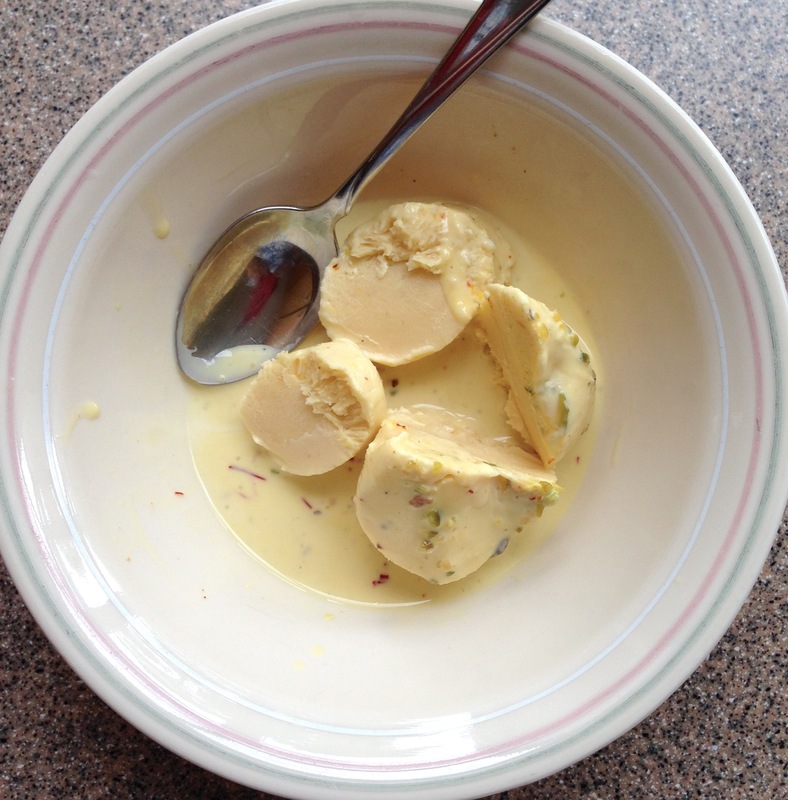 Note: I personally do not like my Kulfi very sweet but if you prefer it sweeter, reduce the evaporated milk to only 1 can. 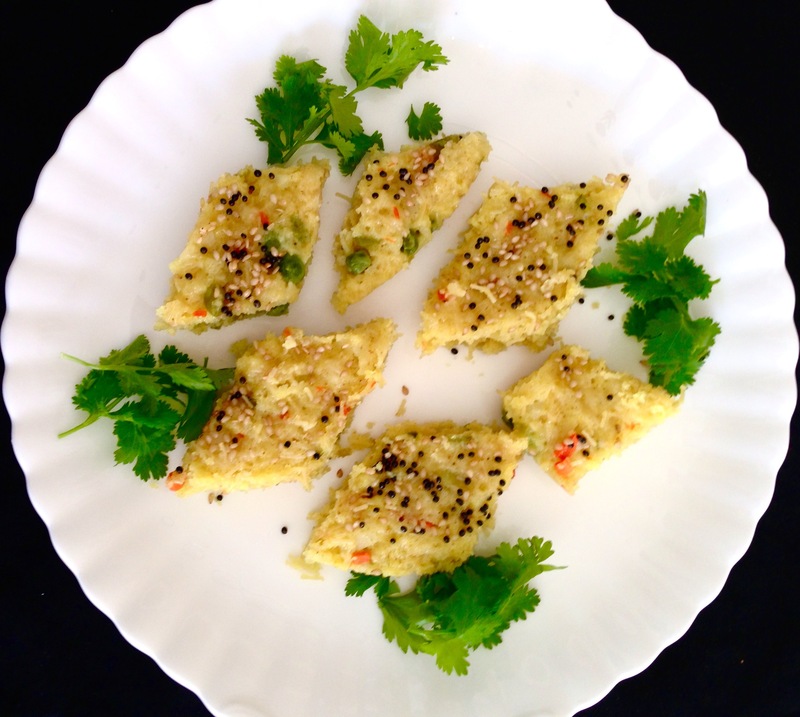 Dhokla is a traditional Gujarati dish, a savory steamed bread with a light and spongy texture. 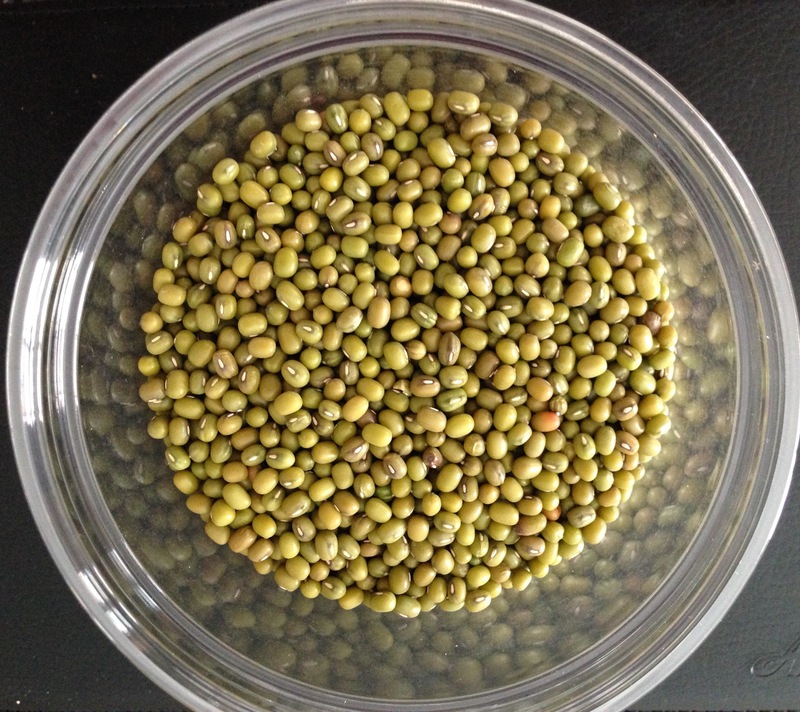 It is typically made with channa dal (split peas) but I’ve had various types, made with rava (semolina or cream of wheat) and besan (chickpea flour). A friend recently introduced me to her version, incorporating vegetables. 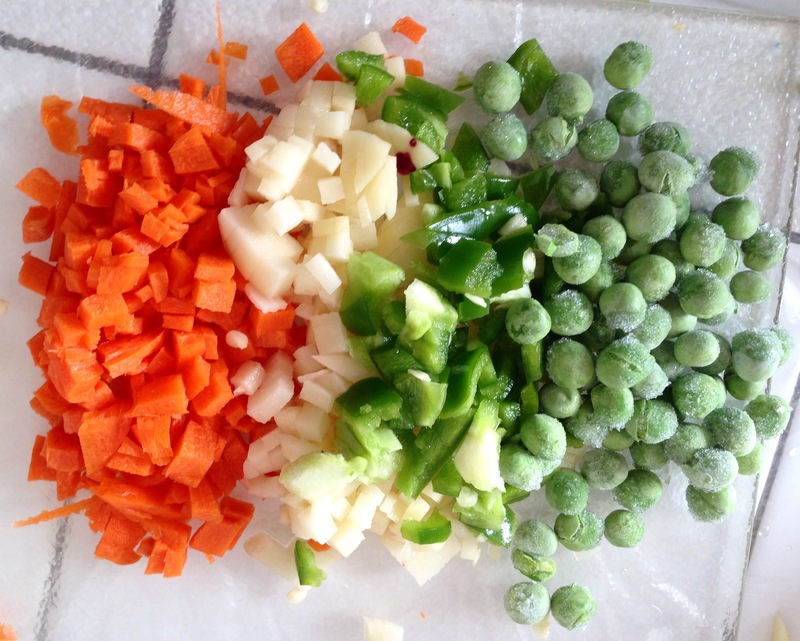 You can use any veggies in the recipe – I always seem to have carrots, bell peppers and frozen peas on hand so I used those. 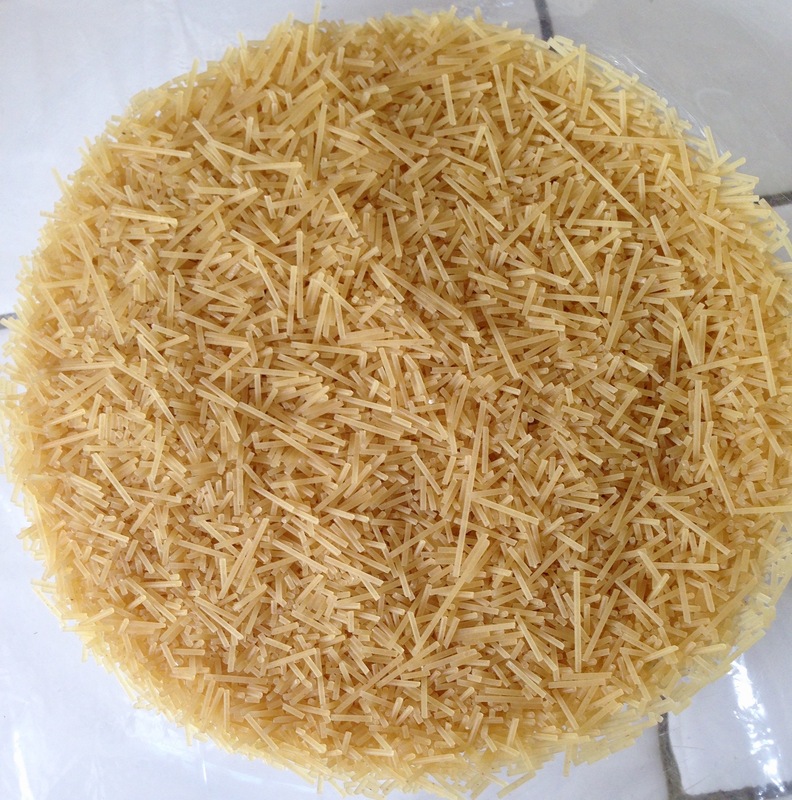 You might be wondering about the pasta… the angel hair pasta and potatoes simply help bind the ingredients together! To steam the Dhokla, boil 2 cups of water in a large 4 or 6 quart cooking pot and keep it simmering. 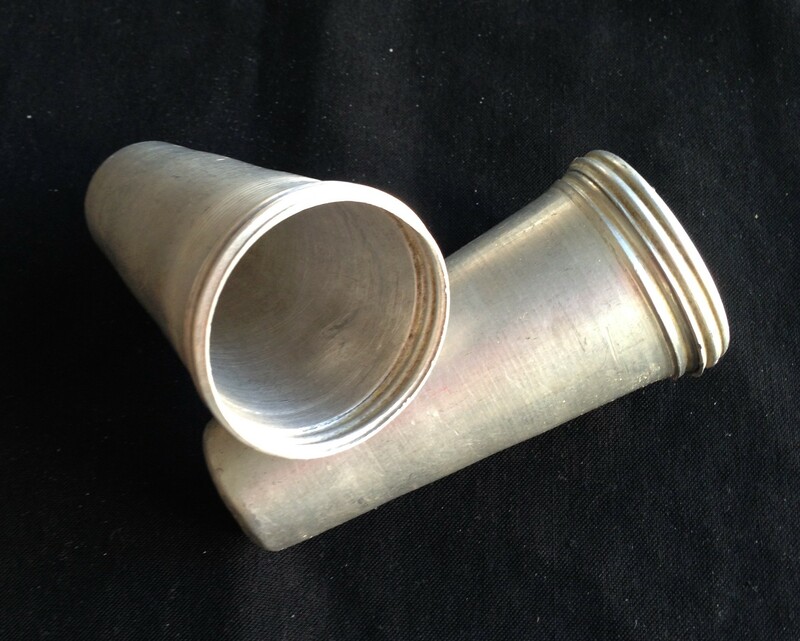 Place a small cooking rack or an overturned small metal container or bowl at the bottom. 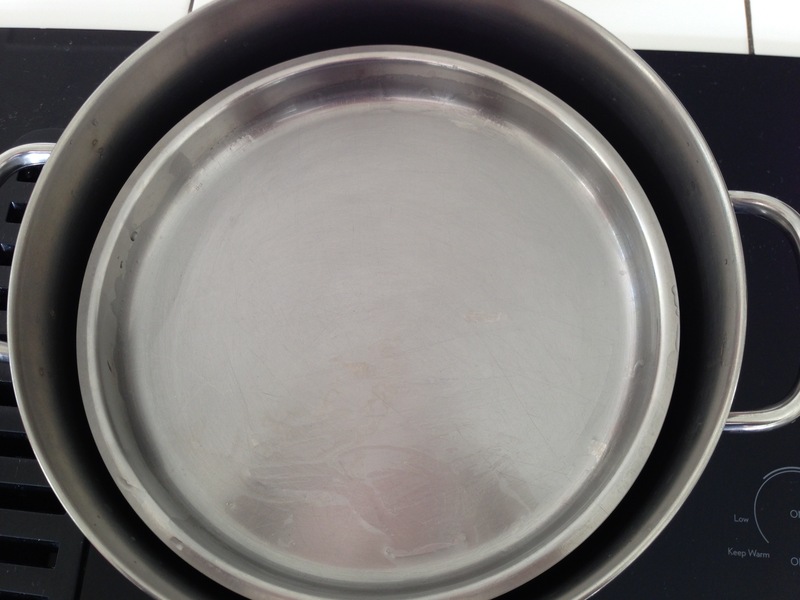 Grease an 8″ cake pan. Add pasta to a mixing bowl and mix in the vegetables. Next add the yogurt and spices, cream of wheat, and oil and mix well. Lastly add the Eno or baking soda. 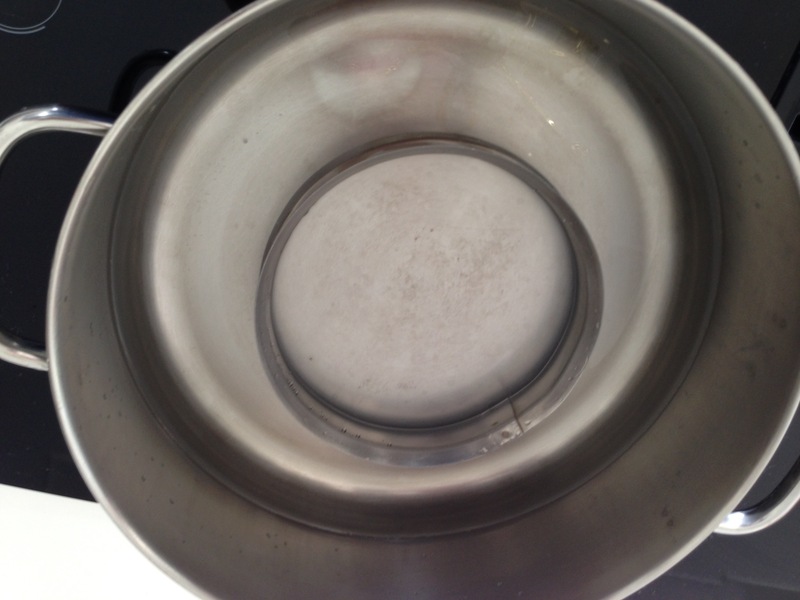 Pour into prepared cake pan, cover with a lid and steam for 15 minutes. 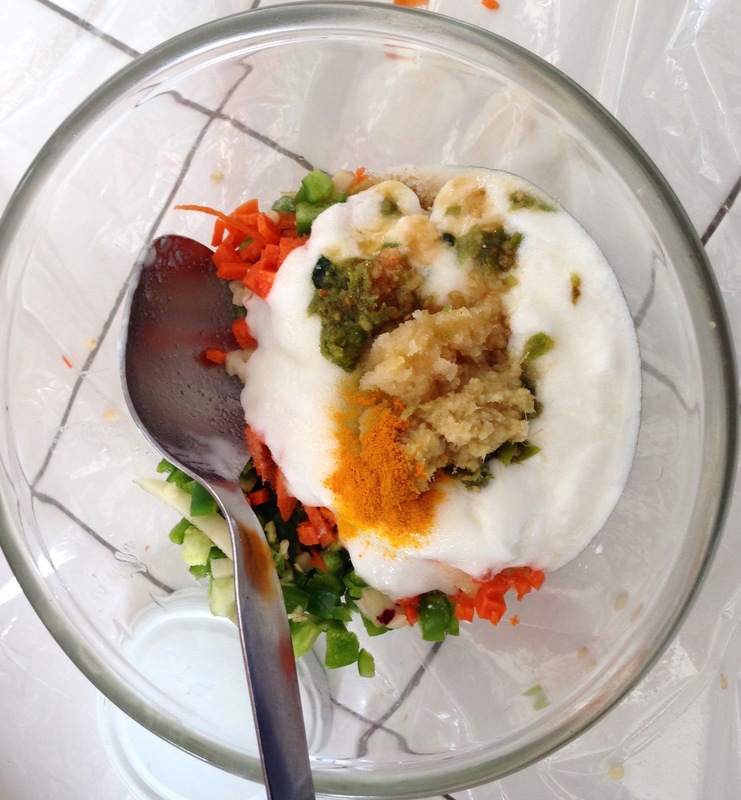 Heat 1 tablespoon oil, add the sesame seeds and mustard seeds and when the seeds start to pop, remove and pour and spread over the steamed dhokla. Remove pan and cool for 5 minutes and cut into diamond shapes. Remove to a serving plate and garnish with chopped cilantro. I have been reading lately about the many non-waffle recipes you can make in your waffle iron. There’s even a blog (waffled tofu & frozen fries!) & cookbook called “Will it Waffle” – 53 “unexpected” recipes! 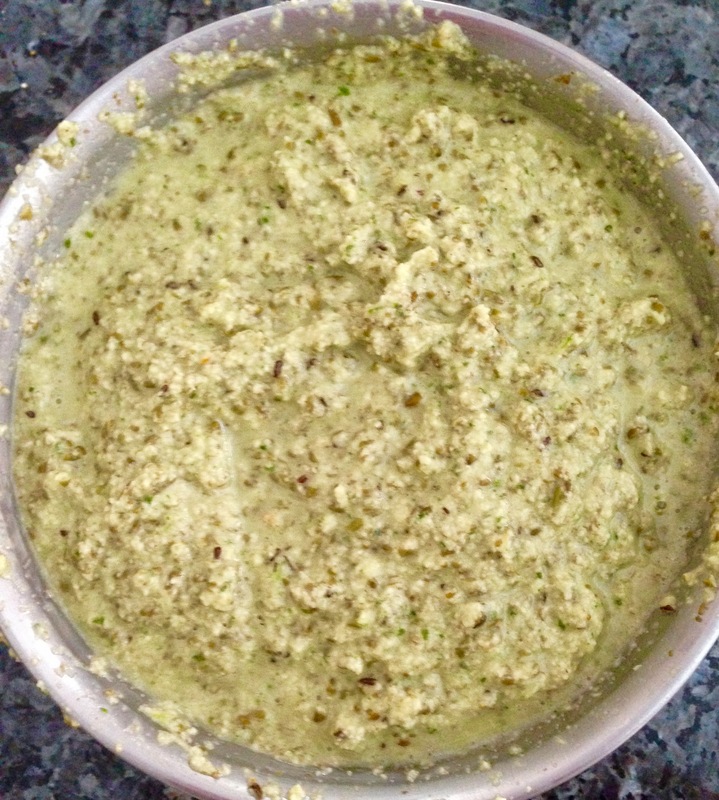 I decided to experiment with a dosa recipe (Indian lentil pancakes) using green moong dal. It is quicker & easier than making dosas on the stove, one by one! I did have to add a few extra ingredients (oats & baking powder) but they turned out great. 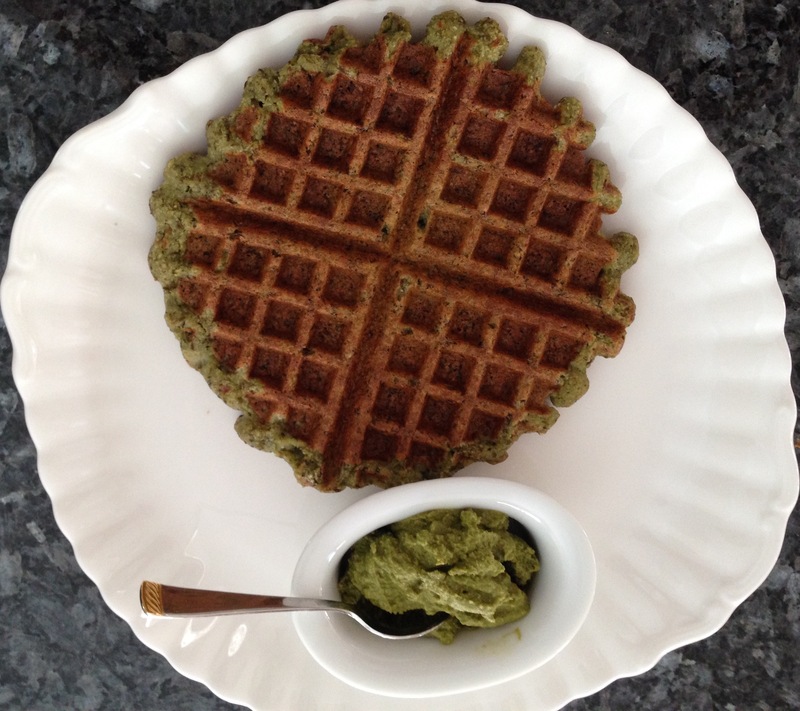 The dosa-waffles can be served with cilantro chutney or even with a spicy ketchup (make your own by mixing regular ketchup with a little of Siracha or hot sauce). These also reheat well and can be frozen. Put all of the ingredients in a blender and process till smooth. Add a little more water, slowly, to get a thick pouring batter (like waffle batter!). Preheat the waffle iron, brush the grids with a little oil, add about 3/4 cup batter (depending on the shape and size of your waffle maker) and cook them. Remove and place on a wire rack. Serve hot with chutney or spicy ketchup.